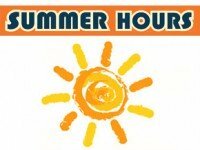 All locations of Windsor Public Library will change to SUMMER HOURS on TUESDAY, MAY 22, 2018. Additionally, the last Sunday this season for open hours at Central, Budimir and Riverside libraries was May 6, 2018. Sunday hours will resume in September. Click here for the 2018 Summer calendar.